Time to sell your Perdido Skye condo? Read about today's resort-market condo buyer. 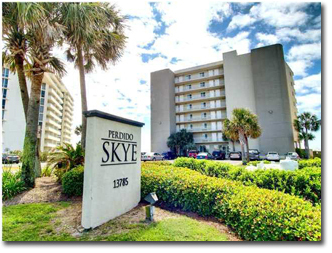 Perdido Skye condominium is located in the central Perdido Key, Florida area near Johnson's Beach and the Perdido Key Bridge. Perdido Skye condos share a Gulf-front pool and all of the units directly face the Gulf of Mexico. The building was built in 1998 and consists of 46 units on the beach on Perdido Key. Perdido Key, Florida is littered with state wildlife refuges and state parks. The beaches in Perdido Key are widely considered some of the most beautiful beaches in the world and run along the emerald-green waters of the Gulf of Mexico. Please let us know if you would like further info for Perdido Skye or any other condos, homes, or real estate along the Gulf Coast or would like to schedule a private viewing by emailing info@condoinvestment.com or by calling 251-978-3718 for immediate assistance. RENTAL TIPS to increase your Perdido Skye rental revenue. Find additional info for annual rental incomes at Perdido Skye and all other condos.